Here’s a video I made about rebounding and the ReboundAIR trampoline I use. Below it, is a detailed blog post about rebounding. Enjoy! Let’s be honest about the immune system, most of us really have no idea what it is, or exactly how it works, we’re just glad we have one. The immune system is incredibly complex because your body has many lines of defense to rid itself of foreign invaders. In this post I’m going to address one critical component of your immune system. That is your lymphatic system. Your lymphatic system is composed of your tonsils, thymus, bone marrow, spleen, lymphatic fluid, vessels, and lymph nodes. The thymus and bone marrow produce white blood cells called lymphocytes. Your blood vessels deliver oxygen and nutrients to your cells. Your lymph vessels are like blood vessels except they are full of clear lymphatic fluid that carries white blood cells (B cell and T cell lymphocytes) throughout your body so they can attack invaders and infected cells. Your lymphatic fluid also carries dead cells, metabolic waste, and toxins away from healthy tissue to be eliminated through sweat, mucus, urine, and liver bile which is carried out in your poop. Lymph nodes are like holding stations that filter the lymph fluid and capture microbes for B and T cells to deal with. They are located in your armpits, groin, neck and around the blood vessels of your chest and abdomen. Every day we are bombarded with toxins in our environment and in our food which is why detoxification is such a critical process in your body. If the detox process is hindered, toxins will build up in your body eventually causing acidity and toxemia. These are the root causes of nearly all disease. You have about three times more lymphatic fluid than blood, but here’s the catch, there’s no pump! Muscle contractions in your body encourage the lymphatic fluid to circulate through a series of one-way valves in your body. So the more you move your body, the more you move your lymphatic fluid. One of the lesser talked about benefits of exercise is that it moves your lymphatic fluid, which promotes detoxification in your body. Your skin is the largest detoxification organ and if you exercise vigorously enough to raise your body temperature you will sweat, expelling toxins out through your skin. Rebounding creates an increased G-force resistance (gravitational load) and positively stresses every cell in your body. As a result, it strengthens your entire musculoskeletal system: your bones, muscles, connective tissue, and even organs. And it promotes lymphatic circulation by stimulating the millions of one-way valves in your lymphatic system. In addition, rebounding is very low impact and allows you to do jumping and aerobic exercises for much longer intervals than you could on solid ground without tiring out or creating harmful oxidative and adrenal stress. NASA produced a report about the benefits of rebounding, which you can read here. The Health Bounce is gently bouncing up and down on a rebounder without your feet leaving the mat. It is very low impact and very effective at moving your lymphatic system. Most folks can easily do this for an hour or more while watching tv. The Strength Bounce is jumping as high as you can. It strengthens primary and stabilizer muscles throughout your body, improves your balance, and moves your lymphatic system like nothing else. That’s what you want to work up to. Aerobic Bouncing is jumping jacks, twisting, running in place, bouncing on one leg at a time, dancing, and any other crazy maneuvers you can think of. Doing these high intensity aerobic exercises will get your blood pumping and your sweat on. If you are too weak to jump you can sit on the rebounder and bounce gently in a seated position. I bought my ReboundAIR rebounder in 2004 a few months after abdominal surgery, and found it too painful to really jump on at first, so I just did the health bounce. As my body healed, the pain went away and I started doing the Strength and Aerobic Bouncing. My typical routine is to warm up for a couple minutes with the health bounce, 5-10 minutes of strength and aerobic bounce variations, and finish up with another couple minutes of the health bounce. I put on headphones and listened to worship music or healing scriptures while bouncing. This is an amazing way to start the day. -Drink 12-16 oz of clean filtered water beforehand. -Take at least 10 deep breaths of fresh air while you do it. -Get sunlight on as much of your body as you can. -If possible do it with enough intensity to break a sweat. Give yourself 7-20 minutes. Sweating is important, but it also means you’ll need a shower afterward. The nice thing about rebounding is you can still get a benefit from it even if you don’t break a sweat. Try to get at least one sweaty rebounder workout per day. I do it first thing in the morning before I shower for the day. If you can’t do it outside, do it inside. Just do it! My wife Micah even used a rebounding workout dvd to lose her baby weight after our first daughter was born. The quality of the frame, springs and mat are extremely important. Cheap rebounders are harder on your joints and can cause injury, also they wear out quickly, and have no warranty. I’ve used a ReboundAir since 2004 and I highly recommend it. ReboundAir was founded by Al Carter, THE pioneer of rebound exercise. In fact my mom even has his original book The Miracle of Rebound Exercise from 1979! The ReboundAir has a Lifetime All Parts Warranty. They used them on The Biggest Loser campus and ReboundAir has been featured on CBS “The Doctors” television show twice. Cool right? They make three models: the Standard rebounder, the Classic Half-Fold, and the Ultimate Quarter-Fold. The Quarter-Fold model is really cool because it folds in half twice (I demonstrate how to fold and unfold it in the video). If you don’t see your self folding and unfolding it often then I recommend the Standard or the Half-Fold models. 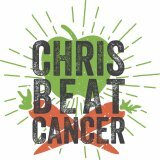 *Use the coupon code ‘chrisbeatcancer’ at checkout to save $20 on all of the models.